Locking Line Barriers is proud to introduce a revolutionary product line that’s primed to set a new bar in large-scale flood protection, WaterBlocks™, along with our new Digital Barrier Sharing Network. Flooding affects more and more Americans every year – and yet, we continue to rely on inadequate systems for managing, redirecting and stopping the onslaught of flood waters. WaterBlocks™ has many useful applications including crowd – traffic safety and control, construction site protection, natural resource conservation and more. 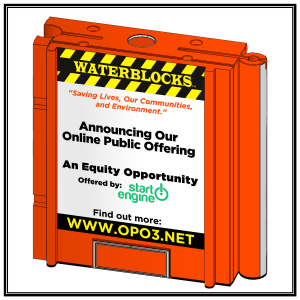 WaterBlocks™ has also developed an integrated business model for long-term success and growth in our new Barrier Sharing Network, a forward-thinking solution that enables communities to have timely access to WaterBlocks™ on a cost-effective, as-needed basis. Flooding strikes with little notice, but our Barrier Sharing Network empowers municipalities, governmental agencies and NGO’s to be better equipped with a new Tool to protect lives, communities and our environment.